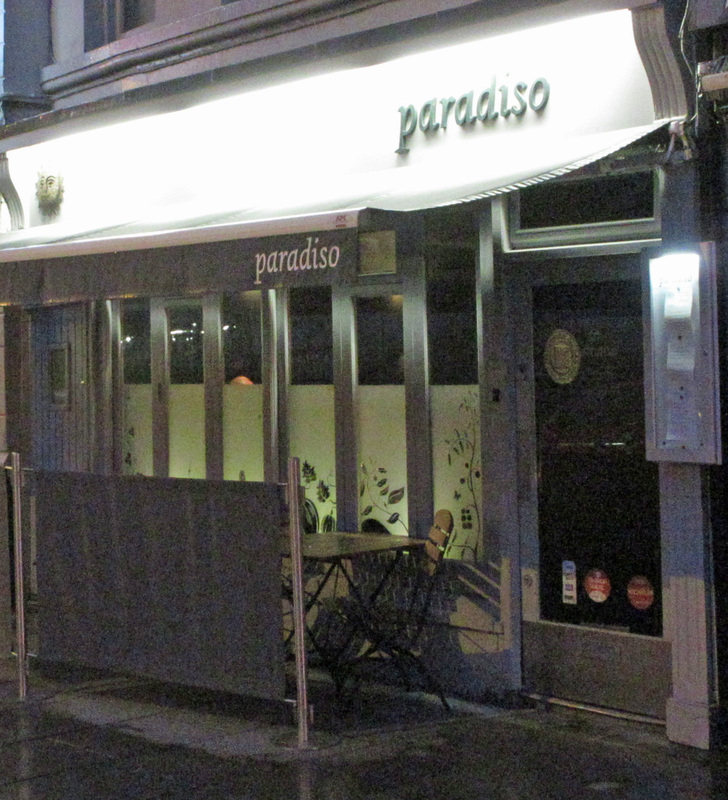 If I put my all too infrequent visits to Café Paradiso together, the common carrot would be the common thread. Maybe I shouldn’t say the common carrot as there is nothing common about the way the vegetable is treated here. You can get it in any state from raw baby (with leaves attached) to roasted as we did last Friday evening. 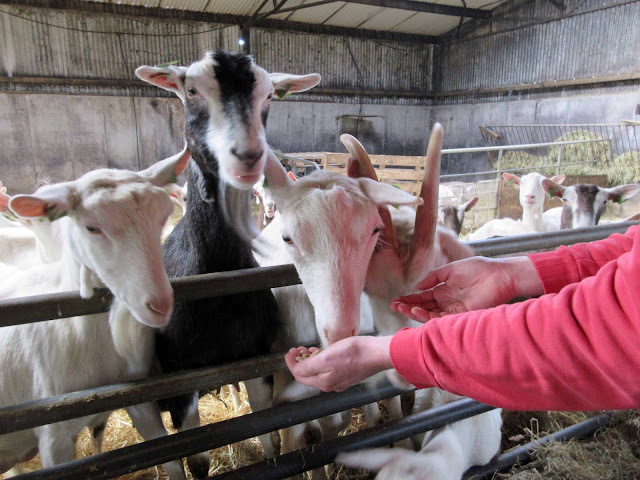 Besides, these carrots come from Gort na Nain Farm and the long-standing combination of that farm and this leading Irish restaurant has seen Denis Cotter of Paradiso and Ultan Walsh of Gort na Nain win the Collaboration of the Year prize at the recent World Restaurant Awards in Paris. 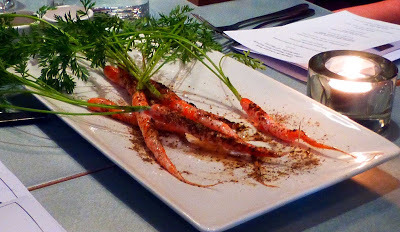 I think my first carrot experience on Lancaster Quay was Baby Carrots with buttermilk yoghurt and the kombu. 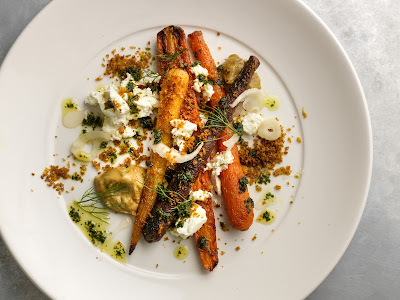 Last Friday’s was Roast carrots, Macroom buffalo mozzarella, burnt aubergine, honey, pickled fennel, ras-el-hanout crumb. Being a country boy, I’m partial to carrot, have grown and eaten a lot of them, but this was exceptional, soft and sweet and so well enhanced by the other bits and pieces. That was one of our starters - we were sharing them as it’s a great way to extend the excellent experience here in this busy, buzzy room, a very popular place even before world recognition! 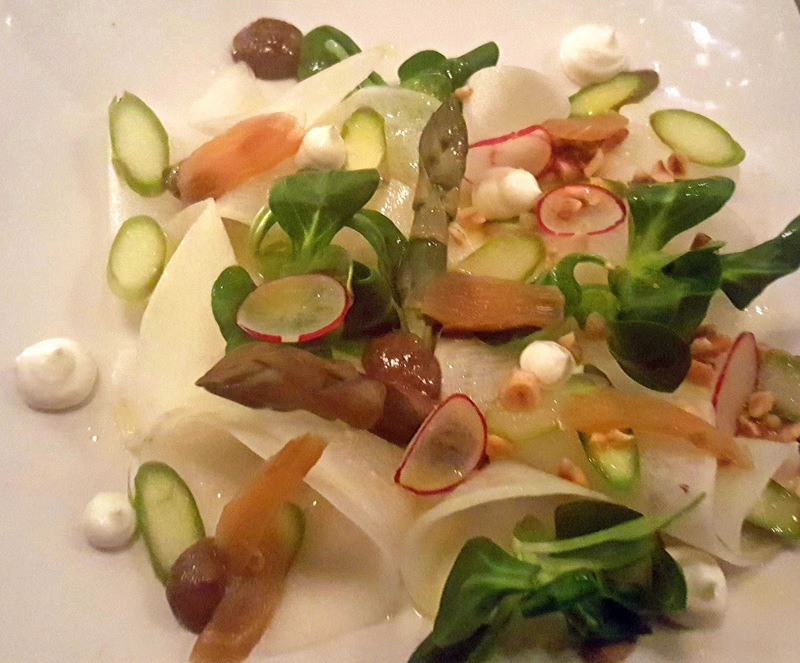 Our other opener was Kohlrabi, asparagus and daikon salad, pickled rhubarb and radish, lamb’s lettuce, black garlic, hazelnut, sheep’s milk labneh. An entirely different dish, more colourful, full of crunchy texture, one to crunch and savour each delicious biteful. Just as with the carrot, you can feel the freshness. These vegetables haven’t travelled far! Just from the farm in Nohoval - by the way, their vegetable stall was due to open this month. Check the Gort-na-Nain facebook for updates here. Paradiso has a superb wine list. The lower end and the slow-moving higher end were chopped from the list about three years ago and what remains is packed with quality, great choices, between approximately thirty and fifty five euro a bottle. By the way, all the wines are available by the glass, by 250ml (quartino) and 500ml (mezzo) carafe and by the bottle. We had started with the Domaine Séguinot Bordet Chablis 1er Cru 2016, bright and vivacious, harmonious from start to finish. And our second wine - we knew we had to have this even before we left home - was the superb Jean Foillard Morgon ‘Cote du Py’, 2016. This natural wine, intense and soft, from Beaujolais is one the very best expressions of the Gamay grape you are likely to come across. 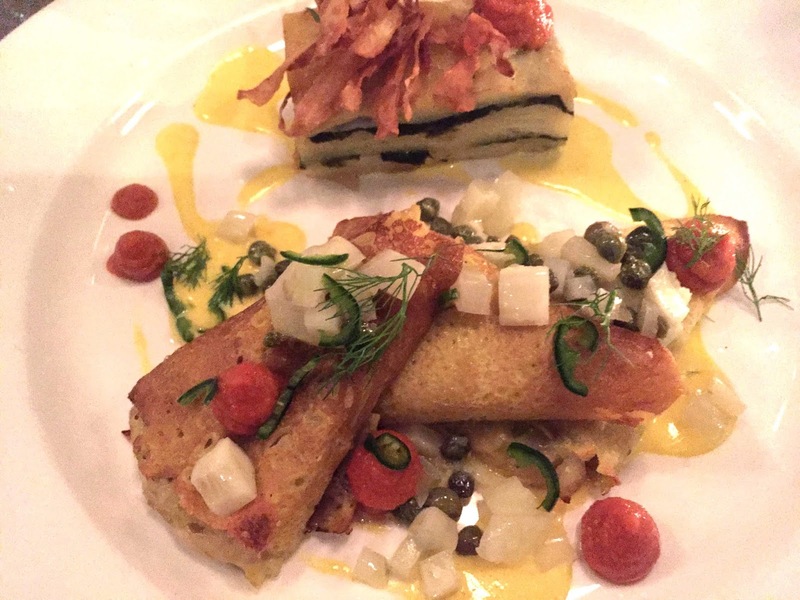 Corn pancakes of leek, parsnip and Dunmanus cheese (by Durrus), potato-wild garlic terrine, fennel-caper salsa, smoked tomato is a delightful main dish, very highly recommended if you get an opportunity to call in. 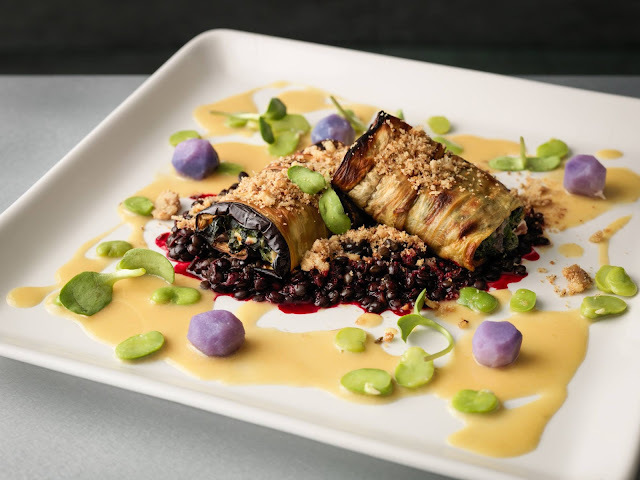 Again we were sharing and we both enjoyed the Aubergine parcels of spinach and Knockalara sheep’s cheese, miso gravy, walnut crumb, beluga lentils, broad beans, purple potato. Thought that the potato was beetroot at first - all those coloured vegetables nowadays makes it hard to keep up! One of my friends, who travels widely in the hospitality industry, told me a few years back: "It is not alone the best vegetarian restaurant in Ireland, it is probably the best restaurant in Ireland”. I wonder has the Michelin man ever called to Lancaster Quay.